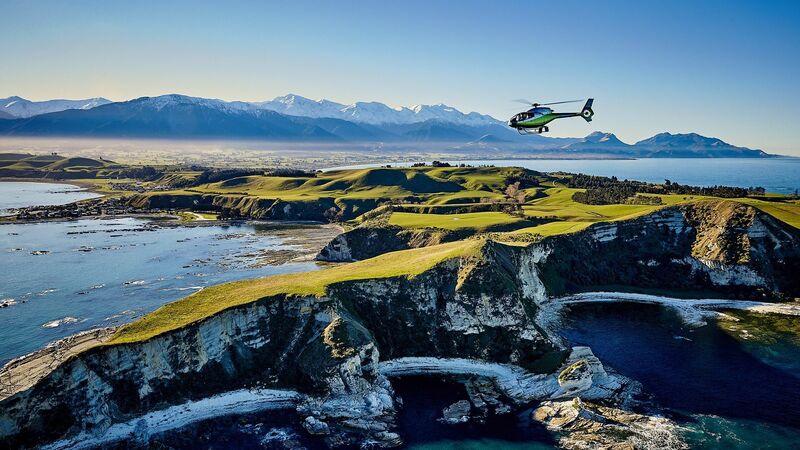 An incredible scenic flight showcasing the beauty and uniqueness of Kaikoura. During this scenic flight you can experience the beauty of the coastal town of Kaikoura, where mountains tower straight out of the Pacific Ocean. This tour starts at our helipads then heads along the rugged coastline of Kaikoura. Along the way you may spot the abundant and playful New Zealand fur seals, or Hector’s dolphins. The experience then continues on to view the natural wonder of the Kaikoura Peninsula, a unique limestone formation jutting straight out into the Pacific Ocean. Photo opportunities of the Seaward Kaikoura Mountain Ranges await you at every turn. You then leave the coastline and head up to the tops of the Seaward Kaikoura Ranges, which reach heights of well over 2000 meters. The Helicopter will make a landing on the peaks, allowing you to get out and experience the incredible views. This is a snow landing certain times of the year. Incredible scenic flight to view Kaikoura’s unique landscape.